These Lamb Burgers are the most succulent, juicy and frankly the most flavorful burgers ever! 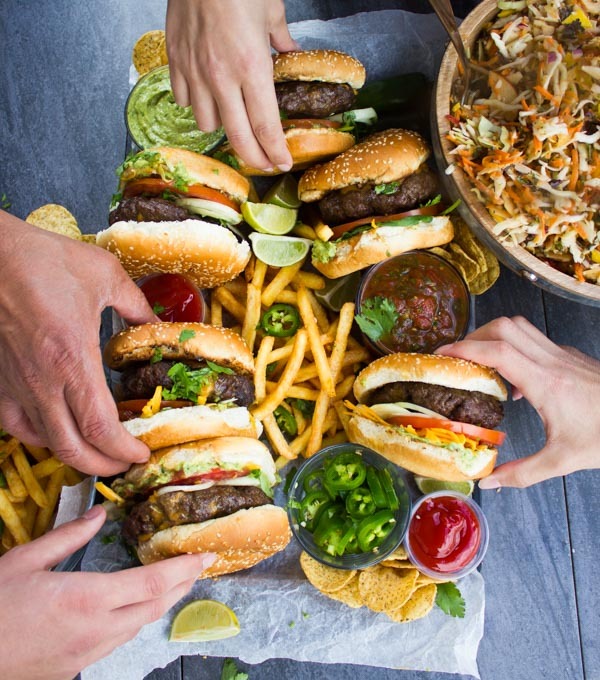 Combining these lamb burgers with the flavors and toppings of nachos just takes them to a whole new level! These are seriously the BEST lamb burgers you can imagine! They’re different from the classic lamb burgers, which are often loaded with feta and yogurt sauce—which, don’t get me wrong, are still delicious! But these nachos loaded lamb burgers offer quite a lot more. 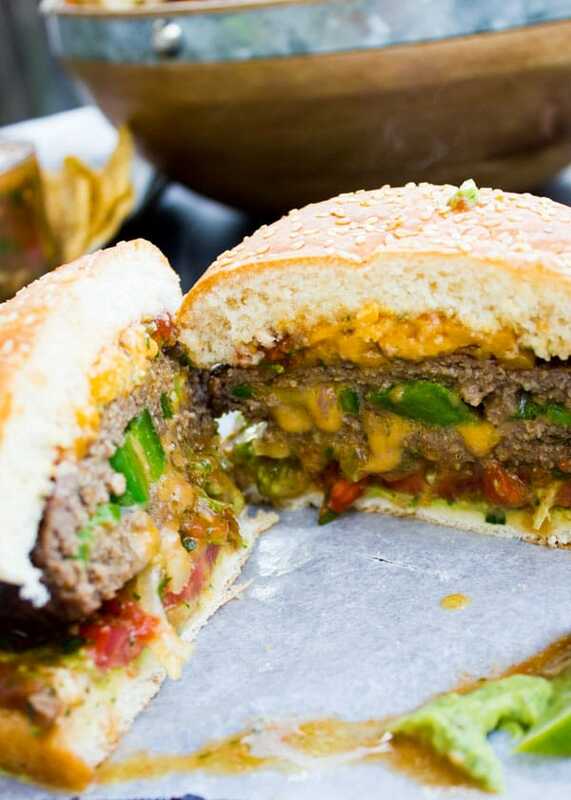 Picture the succulent juicy flavor-packed lamb burger patty stuffed with all your nachos fixing like grated cheddar cheese, fiery salsa and spicy jalapeños! So let’s talk about the succulent lamb burger goodness. First of all, it’s all about the lamb so get yourself some really high-quality American lamb to get the best lamb burgers. Spice it up with flavors that pair perfectly with your nachos toppings—dried oregano, chilli powder, cumin, garlic powder, salt and pepper. Get your lamb well mixed with all the spice but don’t overwork the meat. 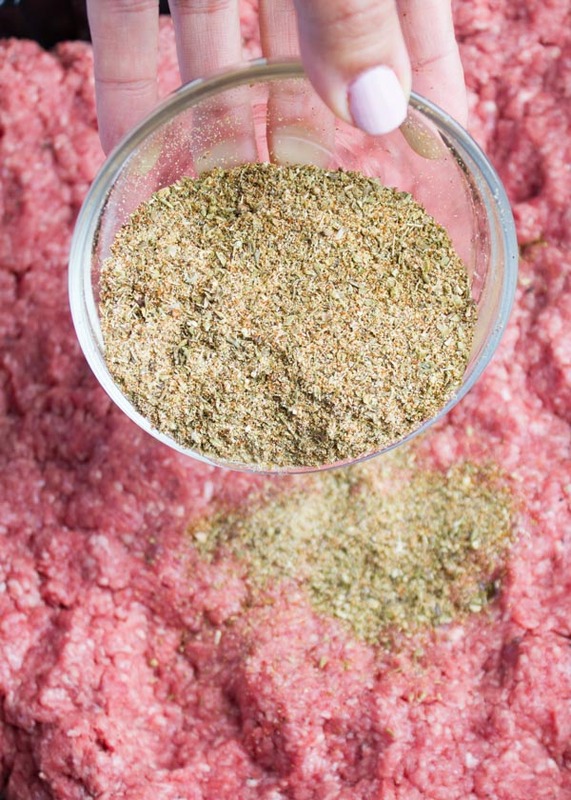 Shape your lamb into patties (the size of your choice—I made 3-inch diameter patties, 1/2 inch thick). 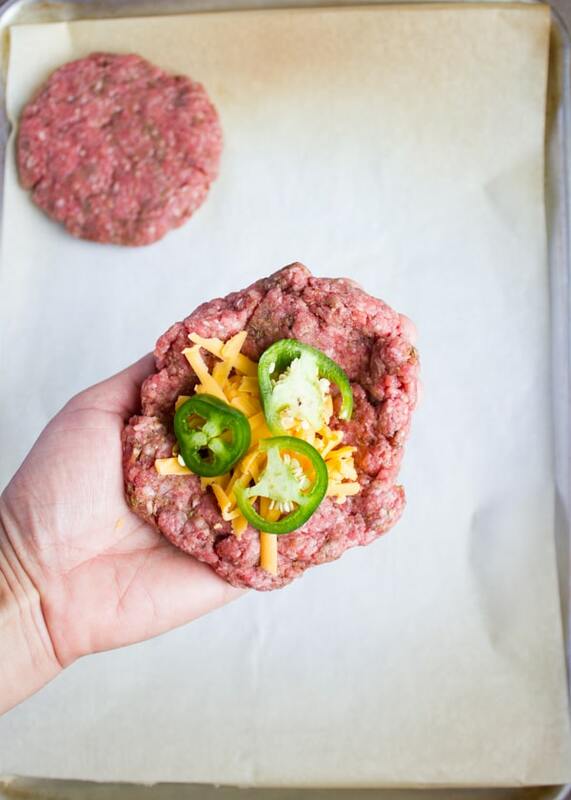 Open up a small hole in the centre of each lamb patty and stuff it with shredded sharp cheddar cheese and sliced jalapeños. This is optional but SO worth it! Now get grilling! The lamb burgers need about 6-8 minutes on each side with the grill covered halfway, and a medium-high flame. While the lamb burgers are cooking, prep your burger buns, toppings and salads. 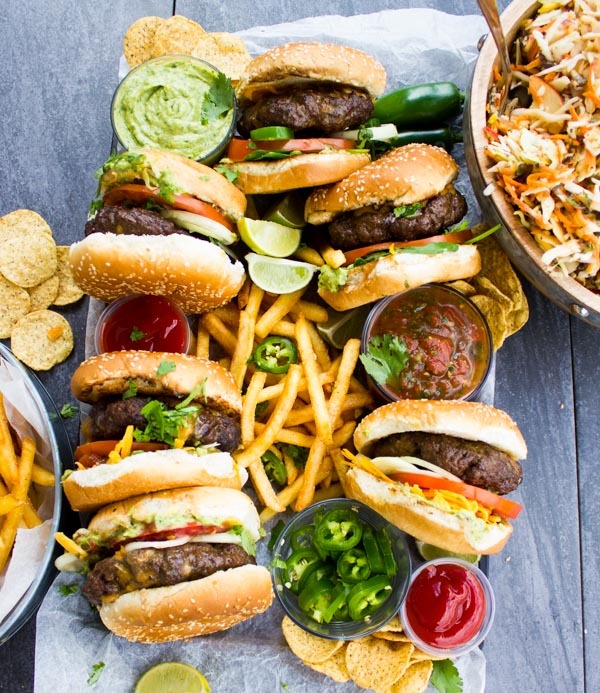 To assemble these best lamb burgers, slather your burger buns with guacamole, top that with salsa, jalapeño slices, onion rings, tomato rings, the lamb burger, cheddar cheese, more salsa, guacamole and crushed chips! Hands down, this is the BEST lamb burger recipe ever! And probably the best way to celebrate this BBQ season and the best meal for Father’s Day! 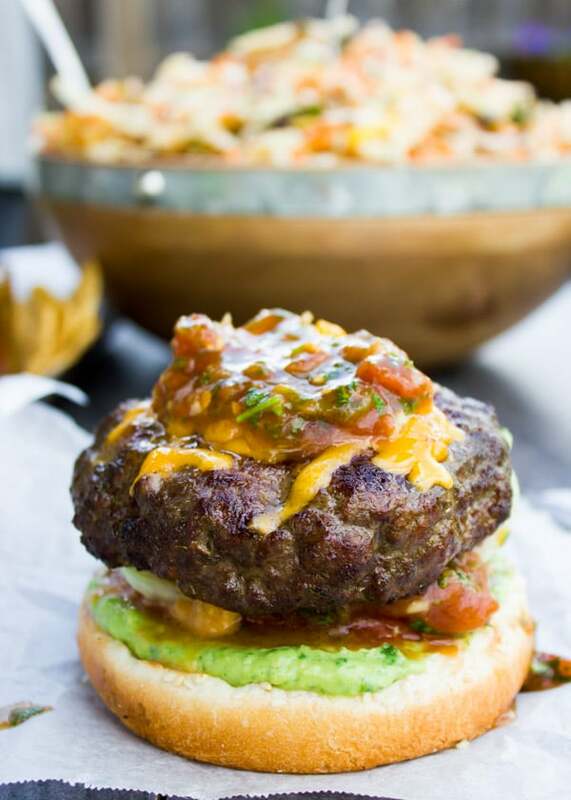 Serve these lamb burgers with this quick Restaurant Style Mexican Salsa and Classic Mexican Guacamole. As side dishes, make some fries and a side of my Coleslaw with Kale Apple Pomegranate (substituted peach for the apples). If you don’t like lamb, you can use regular minced beef instead! Season the lamb with all the spice and gently mix it to incorporate all the flavors without overworking the meat. 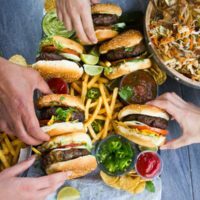 Divide the lamb into 8 large patties—the size is your choice, I made large patties about 3 inch diameter and 1 inch thickness, and set the patties on a parchment lined baking sheet. Take one patty at a time and make a small dent in the centre and widen it so it can take the stuffing. Place about 4 slices of jalapeños and 2 tablespoons of cheddar cheese into each patty (more or less to your taste) and gently seal the patty back to its’ original shape. 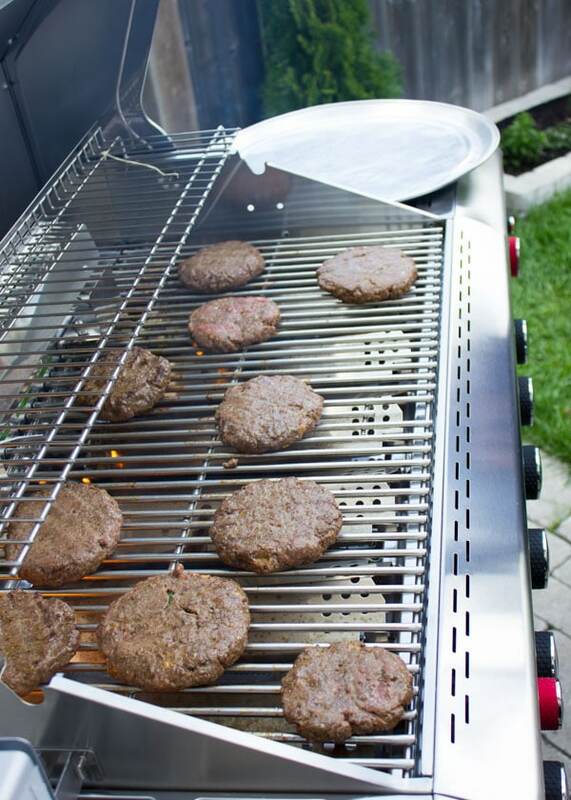 Preheat your BBQ to medium high and place the burgers on the grill. 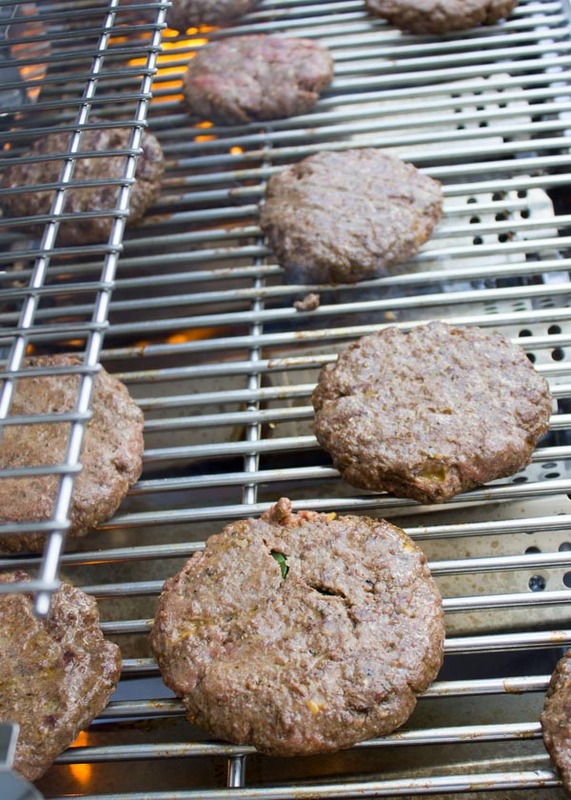 Grill for 6-8 minutes and then flip to the burger. Cover the grill and let the burger continue to cook for another 8 mins (depending not he size of your patties). Keep the grill covered until your lamb burgers are ready. 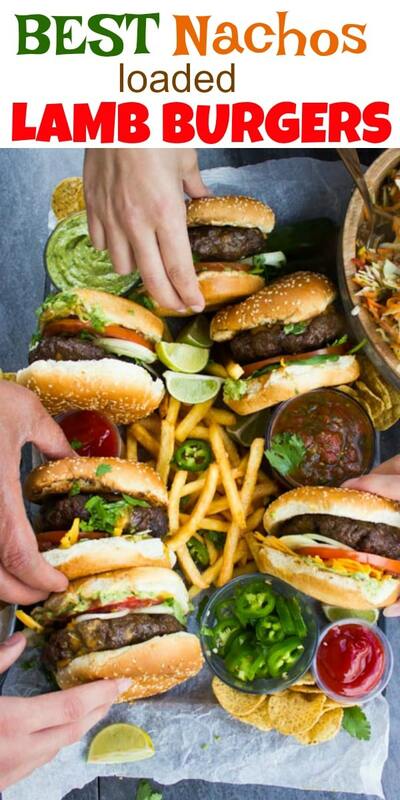 Assemble the lamb burger: on the bottom burger bun, spread a teaspoon of guacamole, top with salsa, jalapenos, onions, tomatoes, the lamb burger, cheddar cheese, more salsa, guacamole, crushed chips and the top burger bun. If you don't like lamb, you can use regular minced beef instead! I just found your blog and all of your food looks tasty. I will definitely try these recipes. I have a question tho, for the burgers. How does the patty maintain its shape like the patties you do ? When I make mine, the meat tends to separate and fall off. I end up with runny burger 🙁 Any advice or tips on how to maintain a perfectly solid buger patty? Thanks Lamiss! 🙂 Hope you try them soon and try as many recipes from the blog as you can! These burgers look faantastic!! Perfect for summer grilling! oh yes Krista they will totally blow your mind!! 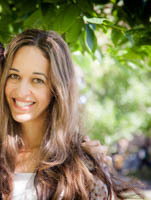 Lamb is key to amazing burgers Amy!! You can’t beat a big, juicy tender burger, especially during the summer. And cooking on the grill is great because it doesn’t heat up the house. We certainly love lamb and eat it frequently but not as burgers. You certainly are inspiring me to put ground lamb on the grocery list. Your burgers looks so juicy and flavorful. Using nacho flavorings on them is such a great idea. Hope you make it Marisa! Now that’s summer!! My kids would feast over this. Not only do they like burgers they love nachos!! I can’t wait to try this.. Sounds so yum. You’ll really LOVE these Tammy! This is such a fun idea! This would be so perfect for a big tailgate or party! These burgers are so inviting! My family will go crazy over these! We say NO to this deliciousness! 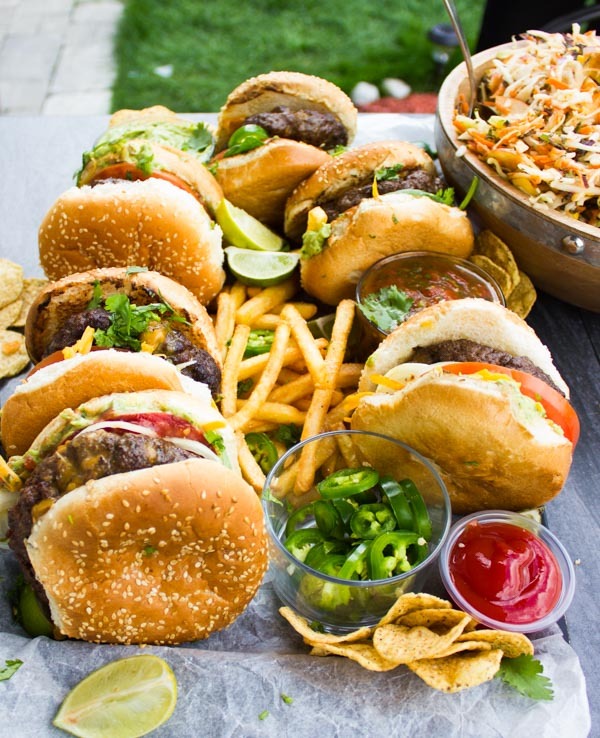 We CAN’T say No to these burgers! They are mouth watering! Hope you make it Catalina! 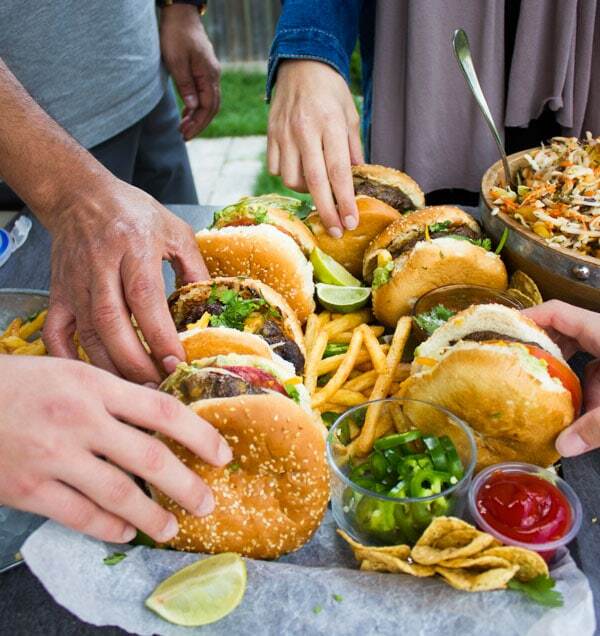 I can see how these burgers are the center of attention at my party soon! They look absolutely delicious and I can imagine how juicy they are – wonderful recipe! April–hope you make this recipe soon! These look amazing! Who cares that I just finished supper … I’m dying for one of these burgers right now! Noel, this will be your go to burger!